When I find something that all 3 of my boys enjoy, you can be sure that I am going to rave about it! My oldest is really not a good breakfast eater. He eats it, but only after I chase him down and force himto eat something. It is so important to start off the day with a good breakfast and to establish healthy eating habits at a young age, so I went on a hunt for something he would enjoy. While in the organic cereal aisle, I decided to try the Cascadian Farm’s Clifford Crunch cereal. I figured maybe if he associated it with a TV show he enjoys, he would sit down for 5 minutes and give it a try. Initially I had to giggle because this cereal is shaped like dog food (little fishes, etc.). Very cute. The first morning, he ate it dry in a bowl with a spoon. Hey he was eating it and enjoying it, so I was happy. He has since started adding milk to it. Given that the cereal bits are pretty small, and the little guys were looking for a snack (ALWAYS looking for a snack) I gave them some of the Clifford Crunch in snack cups. I was not expecting them to be so crazy about it! They kept coming back for more. Man did they love this. I started wishing I had discovered it a year earlier so I could have given them this instead of Cheerios. The first organic cereal made specifically for kid nutrition. An excellent source of fiber, good source of calcium and vitamins E&D, 6 grams of sugar, and a taste your kids will love! Let me share with you a quick and somewhat comical story. The grocery store has been out of Clifford Crunch for weeks. They have filled in the empty space with their overstock of Kashi cereals. So since the spot is not empty, they are not reordering it. This past weekend I got fed up and I got down on the ground and rearranged their shelves to put all the Kashi stuff where it belongs and leave the Clifford Crunch spot empty. Hopefully they will reorder it now – we need our Clifford Crunch! I suppose I could have just went to the manager or customer service to tell them, but where’s the fun in that? 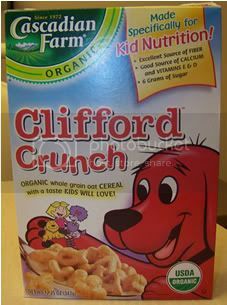 So, if you are looking for an organic, healthy kid’s cereal, I highly recommend Clifford Crunch. And if you are starting finger foods like Cheerios with a younger child, try these instead! 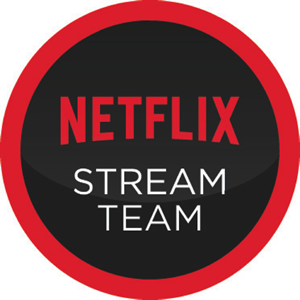 Clifford is a registered trademark of Scholastic Inc. All Rights Reserved.